Every Thursday, I get the opportunity to drive back from SPA using the Barapulla. 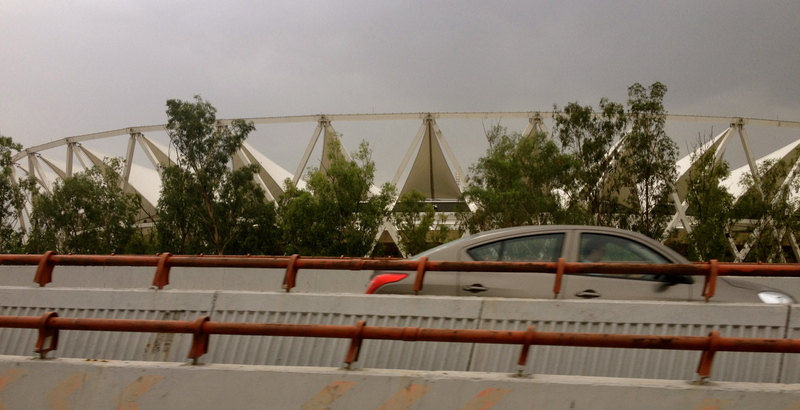 That controversial elevated road that was built in preparation of the 2010 Commonwealth Games. It slices through Delhi. It offers new views, very unexpected ones for someone who has been accustomed to Delhi roads and the views they offer for near on two decades! It crosses many government colonies and many urban villages, you see the crowded, haphazard, highly dense fabric of the city. You see real lives, real people. I stopped at a little market the other day somewhere near Thiagaraj Stadium to buy fruits and there was a lively discussion going on about how much the local chakki (mill) charges to grind a kilo of wheat into flour. And I wondered at whether we who switch loyalties between supermarkets can begin to understand lives that continue to span the urban-rural divide; one foot here, one foot there; mind here, heart there. I got to click some interesting pictures from the elevated roads I took. Some of the art that went up in public spaces was spectacular, some terribly mundane. The JLN Stadium transformed from blah to blitz. I want to take more pictures on this route. It would be interesting to see how people use some of these spaces (or don’t because they can’t get to them). 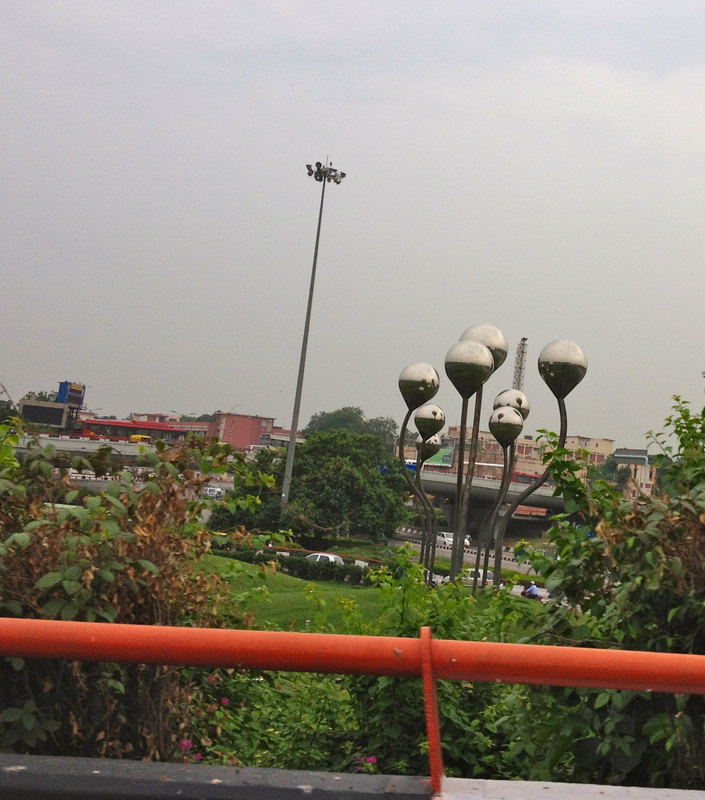 Love these orbs…at AIIMS flyover! 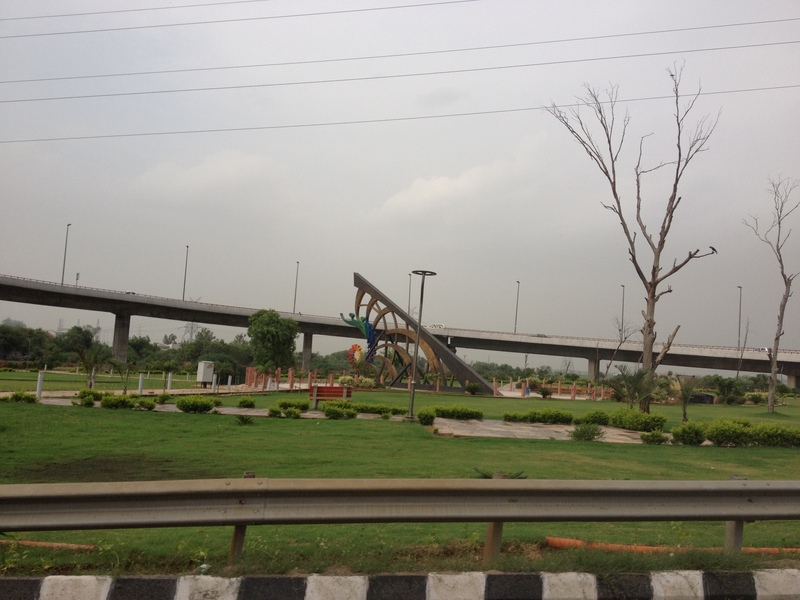 While getting on to the Barapulla…Empty green islands..
Posted on August 12, 2012, in Travel & Experiences and tagged art, Delhi, density, disparity, elevated roads, icons, identity, New Delhi, parks, public spaces, sculpture, urban fabric, views. Bookmark the permalink. Leave a comment.